Parents, we are not here to tell you how to be a parent. But might we suggest you oversee your child’s packing efforts before you head to the airport? You know, just in case said kid decides to include a dangerous weapon in their carry-on bag. 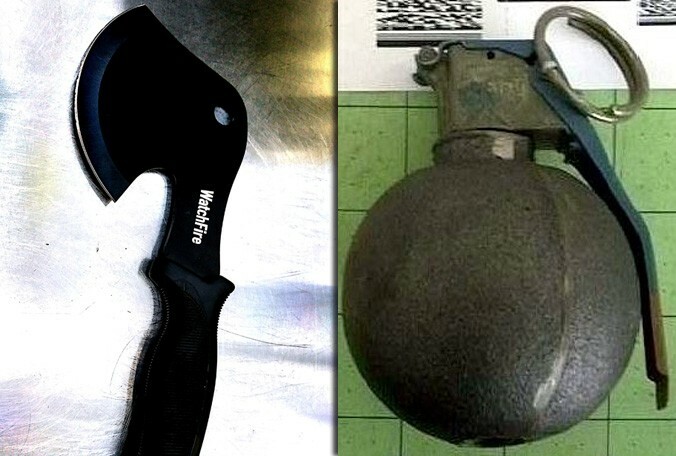 It’s been a doozy of a week, and we can only imagine that a few kids were grounded by their folks: the Transportation Security Administration says agents found a few things in young passengers’ carry-on bags, including a small hatchet and a grenade (non-working, still a bad idea). A TSA spokeswoman told My News 13 in Florida that the hatchet was found in a 16-year-old passenger’s bag at Orlando International Airport on Wednesday. Unclear if the kid was perhaps reading that classic tale of survival in the wilderness, Hatchet, but still, not okay. Earlier this week, TSA workers happened upon a grenade in 12-year-old’s carry-on at Jacksonville International Airport. It was later determined to be inert and therefore, not dangerous. Parents should always supervise their children’s packing, the TSA is reminding folks. “Hatchets, knives, grenades and guns are not permitted in your carry-on bags,” the spokeswoman reiterated. When in doubt, you can enter your desired item into the TSA’s “Can I bring my… through the security checkpoint?” search tool/app, and receive an answer immediately.